Open space concept is pronounced by plenty of natural light from two long rows of skylights. Sizeable windows and glass patio doors furthermore expand charming indoors into lush, scenic outdoors. Expanded open area has a place to cook, dine, work, relax or watch favourite TV programs on 50″ flat screen TV with surround sound. Bright recently refinished room is contemporary, yet relaxed with stone fireplace, slate columns, custom-designed furniture in wood and leather. Unique hand-crafted round marble table with six low stools is an import from the Far East. Artistic displays portray contemporary works of local craftsman inspired by Native Indian Art along with imported ethnic art and antiques. Complete and well arranged, self catered kitchen available for guests. The kitchen features raised bar, glass tile backsplash and hand crafted maple/zebra wood cabinetry. 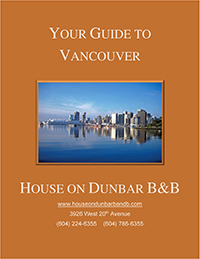 That’s right, there are perks for staying at House on Dunbar B&B. A whole lot of them, in fact. Healthy Heart Breakfast; full or continental. English breakfast not accommodated.